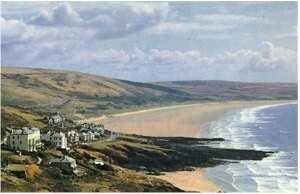 Woolacombe Hotels Cottages Caravan Parks Campsites Devon. Woolacombe is one of the loveliest parts of our beautiful county. For many years a favourite holiday ground, its popularity has never been greater than at present, although railway services have disappeared, car, coach and bus not only provide easy means of access but make it convenient to visit and stay in many outlying combes and villages formerly known to few but experienced walkers and cyclists. Fields of corn crowning the summit of the hills, and, at ones feet, a million dancing , quivering waves. It is not surprising that with such wealth of beauty Woolacombe is a seaside resort of rapidly growing importance. A very few years ago it consisted of a farm and some laborers cottages. Now it has many hotels and boarding-houses, attractive private residences, banks and rows of shops. The site has been judiciously laid out, and building regulations prevent erections which would degrade the character of the place. Woolacombe has grown up at the end of the usual Devon combe, which, however, is much more open and less wooded than some, giving a impression of freedom. On the east, olive-tinted, white-fringed rocks lie like monsters out to sea, separated by lovely sandy coves. Here and there are gleaming white quartz veins in the gray cliffs, gloriously crowned with grass and yellow sea flowers. The main Woolacombe beach is a two mile stretch of fine, golden sand gently shelving into the sea. It is a surfing beach, patrolled in the season by life guards. There is plenty of room for beach games and at the Northern end rocks for climbing, rock pools and all the amenities of a popular beach. Parents find Woolacombe a paradise for children, who have for their enjoyment a fine stretch of sands, perfectly safe, about 3 miles in length. Such a superb stretch is in delightful contrast to the severity of the surrounding rock and cliff. Croyde and Saunton, farther south , are the only other places on the North Devon coast where such sands are found. Surfing is excellent and is very popular. 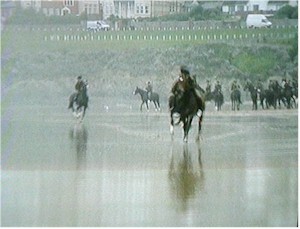 It is claimed that Woolacombe, being sheltered from the north, east, and south-east, facing due west, and overlooking the open Atlantic, has a far more bracing air than any place on the South Coast open only to the south.